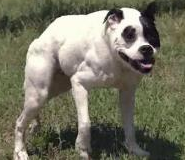 Cuda is a genetically deformed, yet healthy, pit bull. Her back legs are weak and shorter than her front legs. She also has a curved spine and a severe underbite.